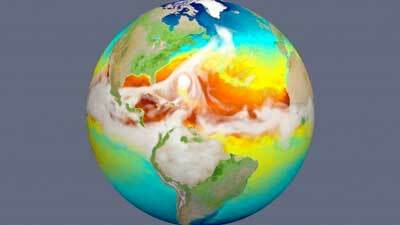 (Nanowerk News) A new earth modeling system unveiled today will have weather-scale resolution and use advanced computers to simulate aspects of Earth’s variability and anticipate decadal changes that will critically impact the U.S. energy sector in coming years. Simulating atmospheric and oceanic fluid dynamics with fine spatial resolution is especially challenging for ESMs. The E3SM project is positioned on the forefront of this research challenge, acting on behalf of an international ESM effort. Increasing the number of earth system days simulated per day of computing time is a prerequisite for achieving the E3SM project goal. It also is important for E3SM to effectively use the diverse computer architectures that the DOE Advanced Scientific Computing Research (ASCR) Office procures to be prepared for the uncertain future of next-generation machines. The E3SM project includes more than 100 scientists and software engineers at multiple DOE aboratories as well as several universities; the DOE laboratories include Argonne, Brookhaven, Lawrence Livermore, Lawrence Berkeley, Los Alamos, Oak Ridge, Pacific Northwest and Sandia national laboratories. In recognition of unifying the DOE earth system modeling community to perform high-resolution coupled simulations, the E3SM executive committee was awarded the Secretary of Energy's Achievement Award in 2015. In addition, the E3SM project benefits from-DOE programmatic collaborations including the Exascale Computing Project (ECP) and programs in Scientific Discovery through Advanced Computing (SciDAC), Climate Model Development and Validation (CMDV), Atmospheric Radiation Measurement (ARM), Program for Climate Model Diagnosis and Intercomparison (PCMDI), International Land Model Benchmarking Project (iLAMB), Community Earth System Model (CESM) and Next Generation Ecosystem Experiments (NGEE) for the Arctic and the Tropics.